Topics: Compound Soaps, Finishing Machines, and High Quality Equipment. 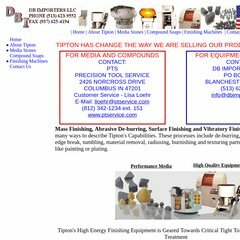 dbimporters.com DBI a importer of Tipton Metal Finishing equipment automated .. It is hosted by Godaddy.com Inc (Arizona, Scottsdale,) using Apache web server. Its 2 nameservers are ns16.domaincontrol.com, and ns15.domaincontrol.com. Its local IP address is 173.201.146.1. PING (173.201.146.1) 56(84) bytes of data. A ping to the server is timed at 59.5 ms.